It’s finally here! 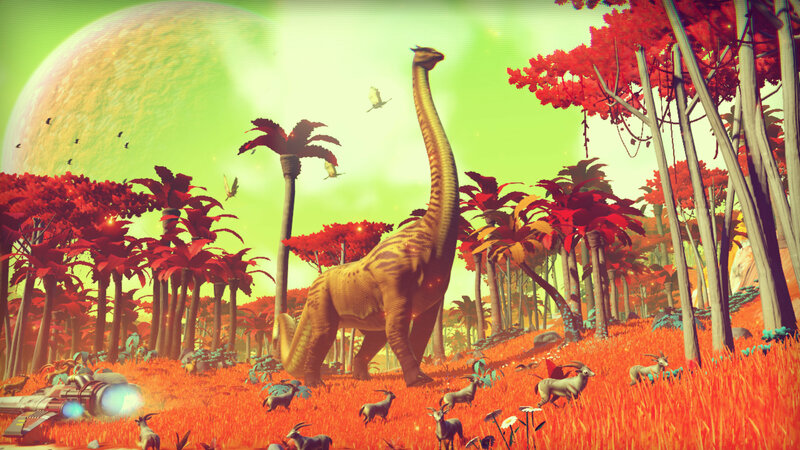 No Man’s Sky, a game that has existed for at least 3 years, has finally arrived. This isn’t a review. This is just my thoughts on the game based on at least a few days worth of play time. I won’t talk about unique planets I’ve visited (I’m saving that for the really interesting ones), but I will touch on the mechanics, narrative, and overall feel of the game. To start with, as you’ve seen from screenshots, the game is drop dead gorgeous. I mean it, no planet is ever dull, regardless of how much or how little life there actually is. The way they used colors for each of the planets is just astounding, and I often catch myself just staring at the overall look of terrain and skies. And despite what your assumptions might be about the graphical quality, it’s actually very impressive, if it does falter a bit due to the procedural generation always causing things to just randomly appear here and there. I didn’t anticipate how many survival elements were going to go into this game. I had an idea, given the descriptions of some planets as being hostile in both wildlife and atmosphere, but never did I realize that meant taking care of my life support systems, shielding, ship components like fuel, my life bar, etc. It’s a bit overwhelming at first, but you soon grow accustomed to it all. Most of the resources you need to fuel everything is on every planet you find, so that makes things mostly easier, given that the entire point of the game is to just explore and discover new stuff. One tip though: ALWAYS carry plutonium. It’s your ship fuel, and is vital to getting off the ground with the launch thrusters of your ship. Thankfully it’s abundant just about everywhere, but keep that in mind. And that’s really the crux of the game. You just go and discover new planets, alien races, strange plants and animals. For the more advanced races, you can trade with them, solve dialogue puzzles (which are kind of easy and vague at the same time), as well as finding alien stones to discover their language…as painfully slow as that process can be. You can find shelters with or without aliens, operation centers (which are often overrun by a strange alien growth), and even discover beacons which show you waypoints around the planet. And these planets are HUGE! I mean it. They even give you a timer for how long it will take to get somewhere either on foot or on a ship. It can take upwards of hours on foot, but a ship will get you most places in less time that one hour, depending on how big the planet is. I’ve been caught in a few space battles. I’ve won at least two, and either died to or ran away from the rest, because my starter ship was just too fragile for those kind of fights. The only way to get new ships is to either find and repair them, or buy them from traders at space stations. Fighting in space is a bit tough, but gets easier with more maneuverable ships and stronger weapons. You can make money in a variety of ways, but the most useful way is through resource trading. Overall, the only thing I wish for is a separation of inventory space and upgrade items. You always need to have space in your inventory if you’re going to discover new upgrades, but they never take up that new space. It’s kind of irritating when I have to constantly shift my items around between my ship and the ground when dismantling them. Aside from that, I’m glad there are no traditional maps or navigational markers here, because when you’re exploring, that kind of stuff tends to get in the way. In all, No Man’s Sky is everything I expected, and sometimes that’s an incredibly satisfying thing. My full review of the game will be up in…well, we’ll see. I might not reach the core, but the deeper I get into the galaxy, the stranger things are gonna get, so that will be something to really talk about. Whoa, how come this page doesn't display the title and author? It's because the template lacks a fallback image. I'll fix that tonight.